This content was extracted from Barney Oldfield's personal scrapbook. As with most of the material in the scrapbook, the organization is very poor but I am always grateful just to see it at all. There are four articles, not all of which were printed on the same day. Two were in advance of the race - the 1914 Los Angeles to Phoenix "Cactus Derby" and another, by far the most interesting is a first-hand account of the race by the winner, Barney Oldfield. The two that were printed prior to the race provide some interesting insights. For example, Earl Cooper and Gil Anderson were originally suppposed to be entered as teammates to Oldfield, but for whatever reason did not appear in the race. 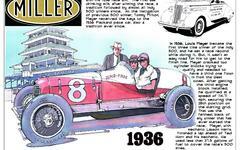 Also, Eddie Pullen had planned to race his Mercer but did not end up in the final field of entries. Those additions would definitely added a lot of quality to an already stout field. Oldfield's article has great color, which is what you would expect from the author. Here's an excerpt: "For genuine thrills, for hard driving, for the sensation of the old man with the scythe brushing so close to your face that you can feel it, I recommend the Phoenix race." Interesting, too, in light of today's workout training obsessed drivers, Oldfield shares that he never trained physically for a race. He admits to being tired at the end of the first day, but fully refreshed the second and third days. A fourth interesting article reports that Barney and some of the other drivers returned to Los Angeles aboard the "Howdy Special" a train of hard-partying automobile company executives who dressed up like clowns, among other things. My guess is that a lot of corn mash was consumed during marathon card games during the trip home.